You have landed on right page pal. In this tutorial, we will discuss, What are the Query Strings in WordPress code structure? Why you should Remove Query Strings from Static Resources? 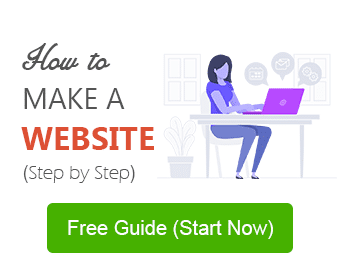 How you can Remove Query Strings to increase your site speed? Page load time is an extremely essential aspect for a website or blog. It helps you to deliver a satisfactory and effective user experience to your visitors. It also helps to get a higher ranking in Google Search, and as a result, you will notice an increase in overall traffic on your website. As Google had announced earlier that page load time affects your search engine ranking. And nowadays, since the mobile first concept came, search engines like Google considering page load time as one of the most important parameters for search ranking. What are the Query Strings in WordPress? First of all, let’s discuss What are the Query Strings? Query Strings are the URLs which contains “?” or “&”. For example, technumero.com/script.js?ver=1.6. It is similar to the CSS and JS files of your website, which usually have the file version on the end of their URLs. Therefore, these Query Strings Resources would be the resource URLs with a “?” or “&”. Few CDNs (Content Delivery Networks) also don’t cache resources with Query Strings i.e KeyCDN or Cloudflare. You must be thinking then why query strings are being used by default. Actually, the query strings are used to versioning a file, which differentiates the resource files from one to another. It is extremely useful for developers to avoid caching problems. And if you are in the development phase of your website, then I would suggest you to remove query strings, once you are done with the site development/theme customization. Furthermore, let’s take stock of baseline result, how query strings are impacting on your website. You should first check your webpage source code for Query Strings. Then, test your website on speed test tools like GTmatrix or YSlow or Pingdom. And identify URLs with Query Strings – “?” or “&”. These URLs should look like the below-given screenshot. Now, as you have identified the resources with query strings, you will notice that these files are your CSS, JS, and Images. Should you Remove Query Strings from Static Resources? So, if you want to enable caching on Proxy Servers, you must have to remove Query Strings (which contains “?” or “&” in their URLs) from static resources of your website. And once you remove these strings, you will definitely notice a significant increase in page speed. I tested my own website technumero.com on GTmatrix and Pingdom, Results you can see in figures. Open the functions.php file of your WordPress theme. Copy and Paste the given-below code at the end of functions.php file. But, before you modify functions.php file, I would highly recommend you to take a backup. Also, you must use a child theme for such a modification in the core theme file. Otherwise, there are various plugins available in the WordPress Repository for free use. You can use one of the following plugins if you do not wish to use code. I will share a couple of different plugins solutions to remove query strings from static resources. However, I always recommend that you should only use plugins when it is unavoidable to use. After all, It’s up to you whether you want to use plugin or PHP code. If you are using a paid theme and updating your theme frequently for latest updates by theme publisher, in that case, it would be better to use plugin instead of adding PHP code. Because your PHP code might get deleted automatically after a theme update. Query Strings can be removed by using a WordPress plugin called Remove Query Strings From Static Resources. I would recommend this method to beginners, who don’t want to mess up with coding stuff. Install and activate this plugin. There is no setting panel, so just activation of the plugin will do the trick. Test your web page load time TWICE and you will find significant improvement. Remove Query Strings From Static Resources with W3 Total Cach plugin. Many WordPress users use caching plugins like W3 Total Cache and WP Super Cache. I would suggest users to use W3 Total Cache plugin settings optimization guide to increase web page loading time. This plugin is one of the most popular caching plugins in the WordPress ecosystem, which dramatically increase your website loading speed. And if you are not using this plugin, I would suggest you give it a try, you won’t regret using it. W3 Total Cache plugin offers an option to remove query strings from static resources. You only need to UNCHECK (if already checked) an option and it will remove query strings from 90% of the URLs. 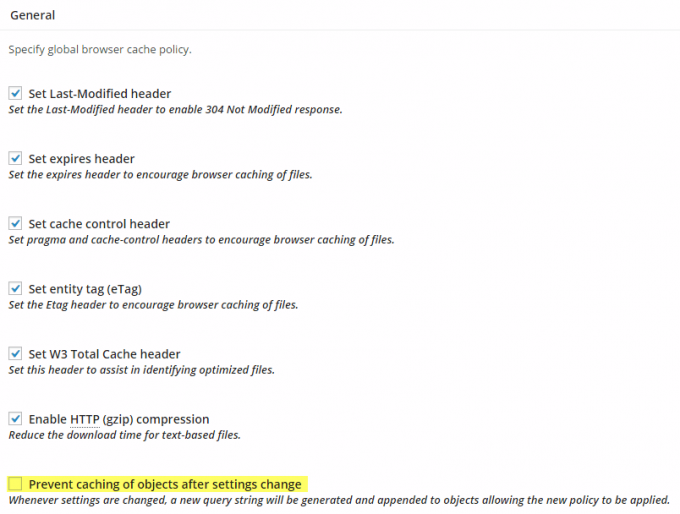 Go to Browser Cache tool tab and find “Prevent caching of objects after settings change” option. UNCHECK it from ‘General Settings’ and don’t forget to click on ‘Save Settings’ button. Now ‘Empty all Cache’ and you are done. Check your page loading speed TWICE and your page loading speed will definitely increase. There is another lightweight WordPress plugin called WP Remove Query Strings From Static Resources. Download this plugin from the WordPress plugin repository for free. Install the plugin and Activate it. There is no configuration or setting page. Activate it and you are good to go. Purge all the cache and check your website on Pingdom. All the Query Strings will be removed automatically from static resources. I have implemented the code on TechNumero.Com and 1st plugin on my client’s website www.karhal.info. I have noticed a dramatic improvement in Page Speed Grades on GTmatrix and Pingdom. You can see the improved results in the figures given below. Just go up and see the baseline test data, my score for query string has been increased from 5 to 78, which quite good. Similarly, Load Time, after the implementation of this code also has been increased. You may find these result outdated, but believe me, it is working fine till date. You can check the results by yourself if you want to. Hope you‘ll find this post helpful. Share your Page Speed Results and your experiences on the above topic in the comment section below. Are you using any plugin or PHP code to Remove Query Strings from Static Resources? Which solution you like most and which one works best for you or you might have any other recommendation for readers. Do share with us in the comment section below. Thank your for the tutorial, where the actually put the code of 3rd one. Glad that you found it informative. You should use the code at the bottom of function.php. As I advised in the post choose this method only if you know well what you are doing. And before making any edit/change, don’t forget to backup your files and content. Technumero, thanks a lot. I think I will go with w3 total cache. Glad that I could help. Thanks for nice response. What i learnt from this post is there is no way to “Remove query strings from static resources” completely. I am stuck at 84 for my website. Glad that I could help. That’s really a nice score. Although 75+ is a decent and acceptable score. Thanks for the awesome feedback. This was really helpful! I’ve been scratching my head for a long time, your php code worked as dream. Thanks! Thank you for sharing this script. It worked at one point until my theme got updated. There is now a syntax error on the first line. Any ideas? Thank you for checking. Glad that you find it useful. Looking forward to listen more from you. Nice tips though. You have mentioned a plugin which has not been updated since a year, there are also other plugins for removing query string, what would you prefer? An updated one or old one? Glad that you find this useful. You can use other methods like W3 Total Cache which is good plugin and also gets regular updates or can do via function.php. Your code worked to remove some query strings, but I couldn’t remove some strings added by Jetpack plugin’s Photon Module! Add to my functions.php and now the site is broken showing a 500 error. Any idea on how to UNDO this? If you are not able to log-in to WordPress, you can log-in to your Web Hosting account and can navigate to function.php file under your WordPress site folder. And can remove the unwanted code from there. To avoid such situation it is always advisable to create a back before editing core WordPress files. Hope, this will help. Looking forward to listen more from you. Thank you so much, your code worked like a charm. In Method 3 , the code has to be inserted in the end or at starting ? Glad that you find it useful. Code is to be placed in side the php tags of function.php. It is recommended to create a Back up before making any changes in core WordPress files or theme files. So that you can revert back if something went wrong. if I was you, I must try that. Anyway thanks for feedback if you had not commented to make a link only. The “Remove Query Strings From Static Resources” worked perfectly on my VPS bringing it from 34% to 90%. Thank you so much for sharing this method. That is a good score. Glad that I could help. Solution #3 works excellent if you’re using a low number of plugins. For a heavy plugin loaded site (one of my sites uses 45 plugins) you have to balance between performance grade and page speed. In my case I’ve increased performance grade BUT page speed went down significant (by more than 1 second). This was because too many query strings had been removed each time a page was loaded causing too much PHP performance load. Too get a better Google rank I’ve decided to offer visitors a better page speed. Just my recommendation: always watch the more important metric – in my case it was page speed. For a low plugin site I’ve got perfect results with this solution. Thanks! The Code Working well on my site. Awesome , Third method worked perfect for me !! I think improving the wordpress load speed is very useful. Very good advice. Great improvement man. Glad that I could help. Yep. You are right, but still a considerable amount of query strings will left as it is and affect the performance. I would suggest you to use the code. i add code at the bottom of function.php file. Any solution for users who are using wp super cache? The code is already there in functions.php and “Prevent caching of objects after settings change” option is also unchecked but the problem is not resolved. I can’t put more burden on my shared hosting so I don’t want to install “Remove Query Strings From Static Resources” plugin. Thanks for the solution – the ‘Remove Query Strings From Static Resources’ plugin worked like charm. I run DesignrsDen(dot)com and i searched my site for pingdom and it showed me to Remove query strings from static resources. i tried the code and the preformance score just improved from 41 to 52 but it is still in the red area. -I also tried Remove query strings from static resources plugin but still the pingdom shows the same issue. I think solution 2 will work more effective than solution 3. unchecking the bos is more easier than inserting a code. I had personally use soultion 2 to my site and it really work. Thanks brother for your great tutorial. I have try this on my site. Anyway thanks for your consideration! Hey Chris, Thanks for stopping by, i would love to share my feedback on your plugin. Is there a way to modify your code to exclude this font? Hi Deve, This code should work fine with Google Fonts. This code will increase your PageSpeed. There are lots of great Web Safe Fonts available, you can use these instead of using Google Fonts. Even when I used W3 total cache plugin, still some static resources have some query strings. Also… I only saw query strings appear the other day as I started to get comments on my blog. Getting rid of avatars and gravitars wouldn’t help and Easy load Comments would not remove them either! It works for but not enough. Still, my Remove query strings from static resources Score is F(30). I am using W3 Total Cache. Please help me. You can use the code along with W3TC plugin. amazing post and 3rd method is actually great where we don’t need any pluggin…. I just used W3 total cache and loading speed has reduced from 3.82 to 2.23 seconds. But there are still many of these query strings. Is there a way I can remove all of them and reduce my loading speed even more? You can use the code along with the W3TC plugin. It should minimize the no. of query strings. 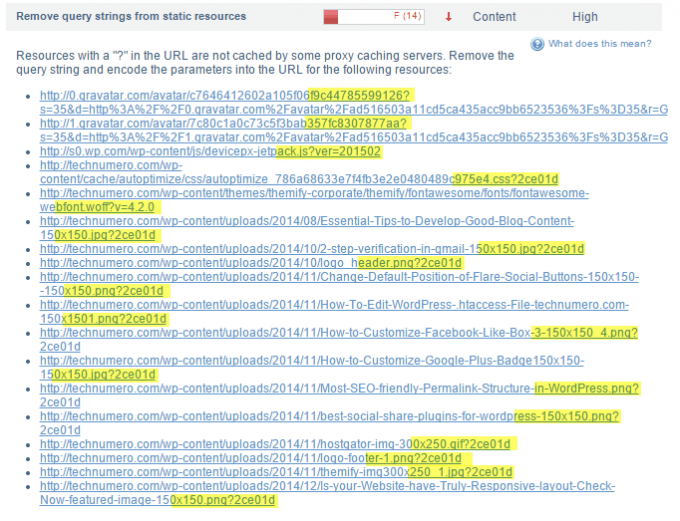 1st plugin not work for my site but w3 total cache is fantastic to remove query string and caching. Doesn’t cut it; code adding is risky cuz you might break your website, and those mentioned plugins have annoying side effects. Great content buddy, makes perfect sense, now all I need to do is to put it to use. Thank you and wish me luck! Hi Milos, Hope you have implemented the hacks. Let me know if any support required, i would be happy to help. Frankly, I think that’s absolutely good stuff.